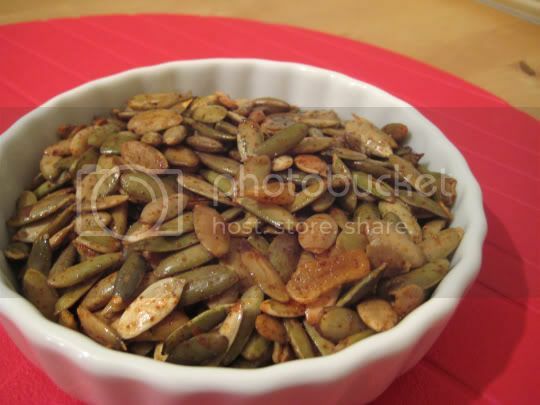 The perfect snack food, these roasted pumpkin seeds (or pepitas) are salty, crunchy, chewy...and holy moly are they spicy! It's a good thing I halved the recipe, because you can only eat about a handful of these at a time. They are hot! But these are a quick solution to hungry guests or a quick snack, and most of the ingredients are already on hand (probably except the pepitas). Use raw pumpkin seeds, as the recipe suggests you roast them yourself (unless you want to try a preroasted variety). And get ready for the next big ingredient...garlic! A whole head of garlic! About 12 cloves are sliced and carmelized over low heat, and then tossed with the roasted pepitas. The garlic becomes milder in flavor, almost sweet, and is a nice chewy contrast to the crunchy seeds. Next add salt and cayenne pepper (the recipe suggested chile de arbol pepper, but who has time to go find that?). If you don't want as much heat, you may want to reduce the amount of pepper by half...otherwise, be ready to feel it! Make again? Yes, and these also keep well in an airtight container and room temperature.